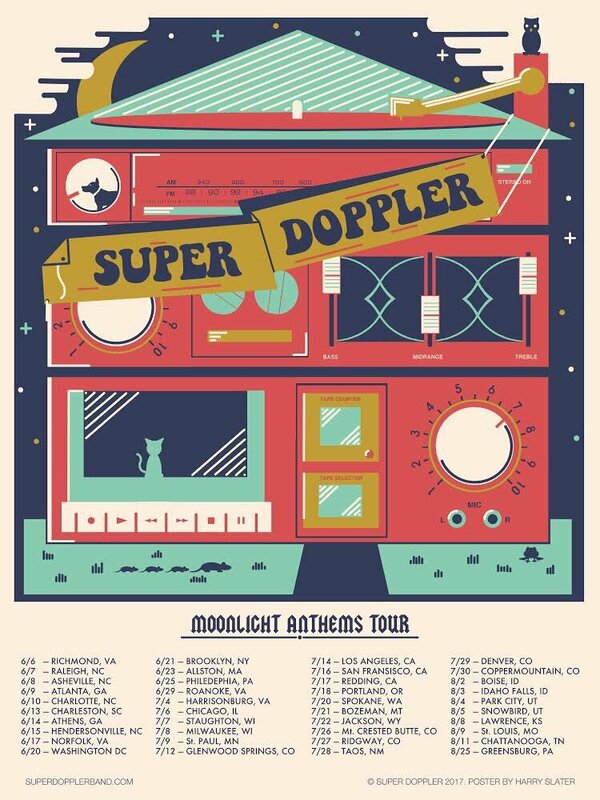 Super Doppler’s Michael Adkins takes time in the midst of his band’s U.S. tour to talk ‘Moonlight Anthems’ and its ’70s-inspired sound. With the 50th Anniversary of The Beatles’ famous Sgt. Pepper’s Lonely Hearts Club Band, celebration has been on the minds of many. It’s been a great time to reflect on music; where it has come, how it has evolved, and more importantly, where it’s going next. Though many artists love to reflect on and listen to music from past decades, there seems to be a push to create new sounds, and to push music into a direction that wasn’t yet fully available during the time of our beloved Beatles. It appears there’s a desire to create or find that one new sound that will revolutionize music in the way John, Paul, George, and Ringo did 50 years ago. Of course, this trend isn’t true of everyone. 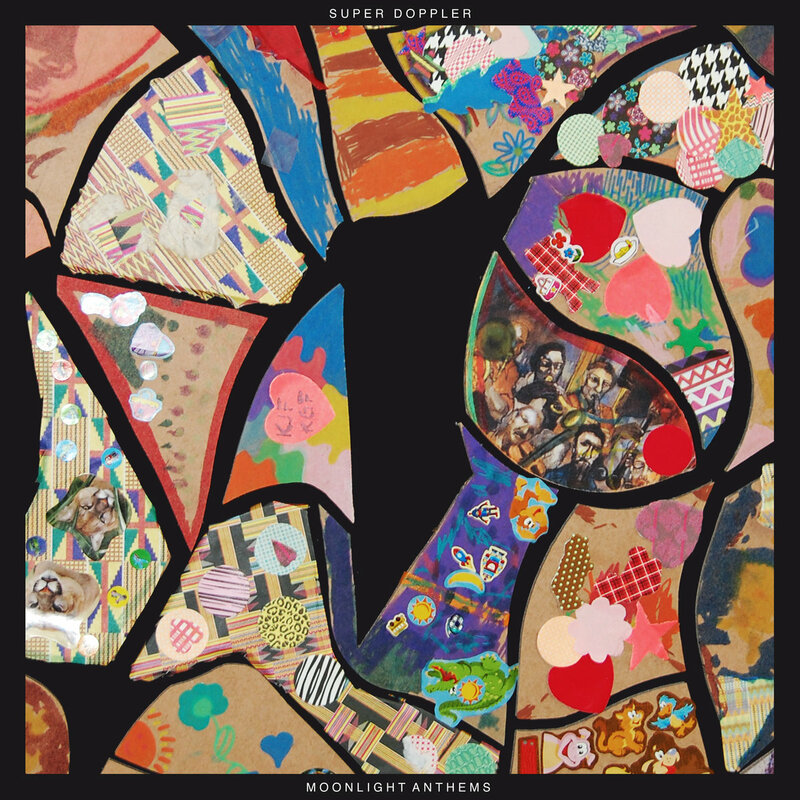 Super Doppler is a psychedelic, rock n’ roll six-piece from Virginia, intent on capturing the sounds of the ’70s. Having a variety of different influences, the band wants to put a unique twist on those beloved sounds from music’s past, and transport people back to a time on innovation, experimentation, and good old rock n’ roll. Atwood Magazine caught up with Super Doppler’s Michael Adkins in the midst of their national tour to discuss the band’s sound, influences, and songwriting process. Atwood Magazine: Can you tell me a little bit about the formation of the band? Michael Adkins: There’s two sets of brothers in the band, so at least four of us have been playing music of one form or another since we were kids. The band itself started about nine years ago when were sophomores or juniors in high school, so we’ve been playing together for abut that long. But, like I said, I’ve been playing with my brother since before that, and then Cole and Neil— they’re twins— they’ve been playing together since about middle school. Very cool! And you guys had a different name before Super Doppler, right? Michael: Yeah, so we were “Major and the Monbacks”. . . it was basically nonsense that we came up with when we were in high school. “Monback” meant “come on back,” which is something the Friedman’s dad would always say, because that’s where we would always practice. He’s a very big motivator and supporter of the band, so he would always try and get us to come back over to the house the play and to practice, so that’s where that came from. I don’t know if you’ve looked it up or whatnot, but “monback” has an unfortunate obscure racial application to the phrase, and we’re not trying to popularize that part of the history, and we’re not trying to popularize that phrase or application, so, as we spread out our reach and influence, we wanted to play it safe and change the name. Yeah, that makes sense. Did you change the name before your most recent album release? Michael: Technically, yes. We had to make that decision a couple of weeks before the album was made. So, we rush-ordered CD’s with the new name on it, and moving forward, “Super Doppler” is what we’re doing. Can you tell me a little bit more about your new album, Moonlight Anthems? Those comments bring me to my next couple of questions. Your album sounds like a child of the 60s and 70s, so what inspired that sound, and how are you all able to write and capture this sound? Michael: Well I think, in my point-of-view, everything always boils down to The Beatles. They set the spark that bands in the late 60s and early 70s all took their cues from . . . they gave us the freedom and the path so that anyone can do whatever they want, and we can play the music that they want. And that’s what we’re doing. We’re trying to capture the music of an early 70s, turn of the decade sound, all of which was pieced together by all six of our influences. You’ve got six guys that all have an idea of what will sound cool on the track, so there’s not one influence, but it’s all from that era. We used old pedals that they would have used back in the day, so there was a lot of purposeful recreation, and it’s sort of a mosaic that turned into this early 70s, psychedelic rock n’ roll. So, with all six of you having your own influences, how do you guys write the songs individually and then come together and make it work? Michael: Well, like I said, there’s sort of been three of us— me, Harry, and Neil—who have traditionally brought the songs, either the bare bones of it, or a nearly completed song, and then the rest of it is sort of left up to the instrumentalist themselves. We don’t refrain from telling each other that something sounds bad or something sounds good, and it sort of gels to where we work together until it works, and until we agree democratically, that we’ve created the best sounding thing. We have our songwriting credits, but we like to think that everything is written and produced in part by all the members of the band. Switching gears a bit, how do you guys hope your audiences feel when listening to your music? Michael: I know a lot of us don’t take the lyrical side to our music very seriously. We weren’t trying to make people think so much, as hoping that they would kind of feel the age and the sound, and where we were coming from and what we were trying to do. I think a lot of artists nowadays are trying to do some new, inventive, one of a kind type of thing, but we are picking up the pieces from our forebearers, and take those pieces that they gave us and do the best with it and make something new. I love hearing the hundreds of different bands people try and compare us to, and that’s the greatest compliment, because that means that we’re not whittled down to one point, there’s a bunch of different influences. That’s awesome! So, to wrap things up, what’s next for you guys? Michael: I’d imagine we’ll get back from tour, take a few weeks off and get some rest and relaxation at home, and then get right back on the horse and start writing and showing each other new stuff. We get pretty restless and we constantly try to keep creating. We can’t really write new stuff on the road because we’re pretty pressed for time, so we get hungry for more. Well, thank you so much! I appreciate it!